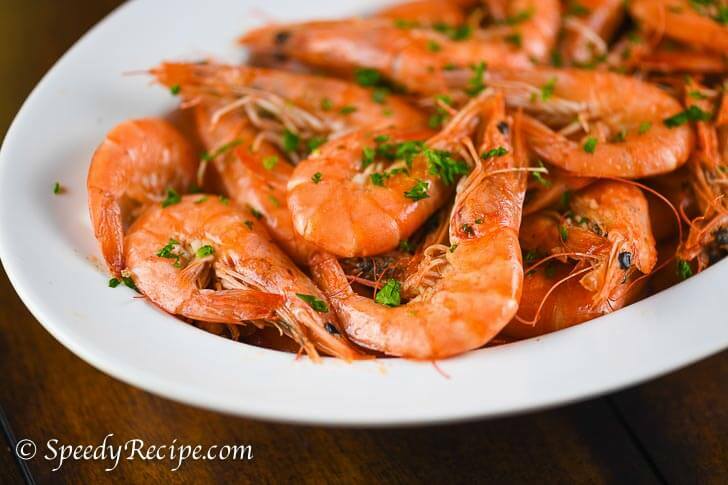 This is an quick and easy recipe for garlic butter shrimp. It is more of a Filipino version because this makes use of shrimp with head and tails on. You can also use the frozen shrimp (without head and shell) sold in the grocery. I got this recipe from Vanjo, but I added a little bit of modification. For example, the original recipe calls for butter alone. This recipe suggest to use 1 tablespoon of olive oil so that the butter will not get burnt easily. Adding virgin olive oil increases the smoke point of butter. This means that it helps the butter higher temperature. The olive oil did not affect the taste of the dish. In fact, Mr. Panlasang Pinoy thinks that this is better than his recipe (he is nodding his head right now as I type) 🙂 . Garlic Butter Shrimp is literally quick and easy to cook. I started by melting the butter in medium heat. The olive oil was poured once the butter completely melted. It will not take long until the olive oil and butter mixture gets hot enough to cook the shrimp. Once the oil is hot enough, add the garlic and let it cook until the color turns light brown. Slowly and gently slide the shrimp into the pan. 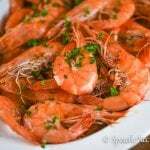 I will advice you dry the shrimp as much as possible to prevent the oils from splattering while adding it. Start to stir-fry the shrimp until the color turns orange. This will be your queue to add the salt. Start to add half a teaspoon first and then taste it. If you think that the salt is not enough, add more as needed. See how quick and easy it is to make one? 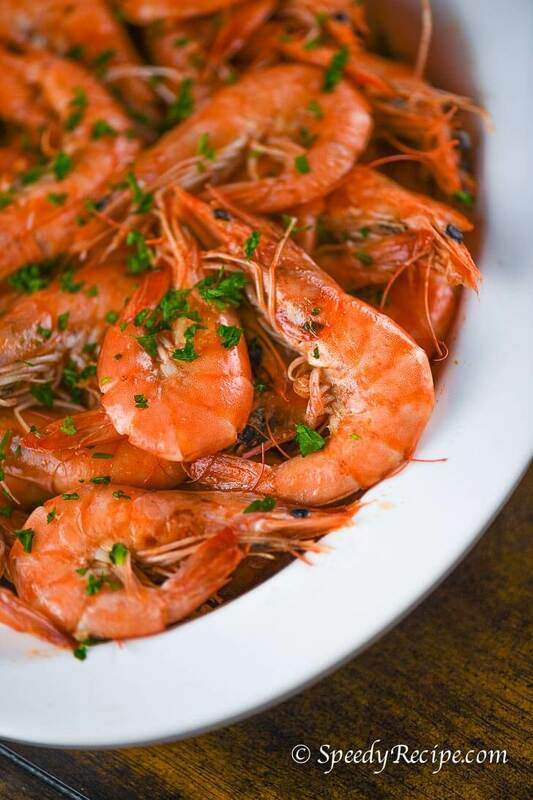 Don’t forget to sprinkle some chopped parsley over your garlic butter shrimp. Add the garlic. Continue to cook until the color turns light brown. Gently add the shrimp. Stir fry for 3 to 5 minutes. Add the salt. Continue to str-fry for 2 minutes. Transfer to a plate. Sprinkle the chopped parsley on top. 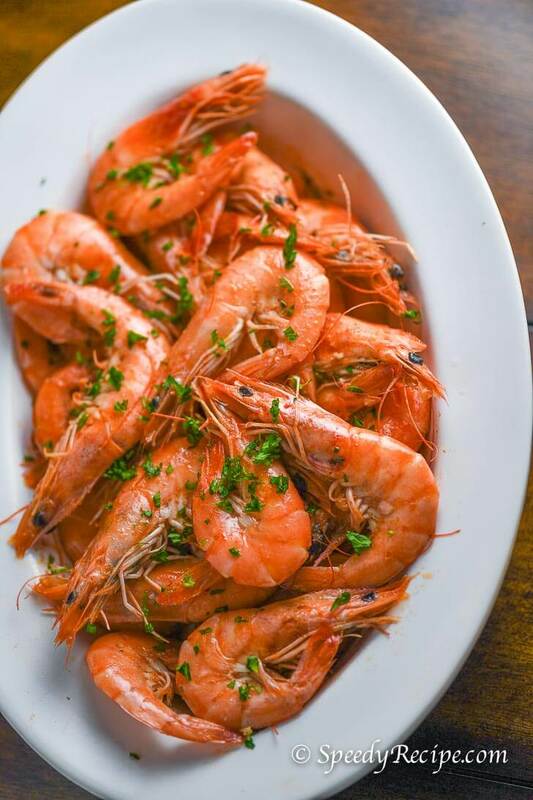 Daisy – I like how you presented the shrimp, it is beautiful and appetizing. Was able to try Vanjo’s recipe and we all loved it. I can’t wait to give this a shot. Thanks for noticing the simple plating. Please give this a try and tell me what you think. I wish that I was there in Cali today because it is freezing cold here. You don’t clean the shrimp? Recipe says shrimp with shell, cleaned. This was really good. I added dried chili flakes to the garlic and butter before adding the shrimp to give it a little spice. Thanks for trying it. Adding chili flakes is a good idea.